This year’s flagship Apple smartphone, known as the iPhone XS, is one of the best iPhones that Apple has ever made. While Apple completely transformed the iPhone design last year with an edge-to-edge OLED display, the introduction of the Face ID facial recognition system, and the signature notch design with the iPhone X, this year’s models are innovative and polished as well. With a number of high-quality smartphone devices across a wide variety of brands, it can be hard to decide which one to buy. But here is a guide that includes a breakdown of the iPhone XS pros and cons to help you decide if this is the one that you want. The iPhone XS was built with a durable aluminum alloy and glass that is stronger than ever before. But I would still highly recommend putting a case on your iPhone XS to prevent scratches and cracks in case you drop the device. 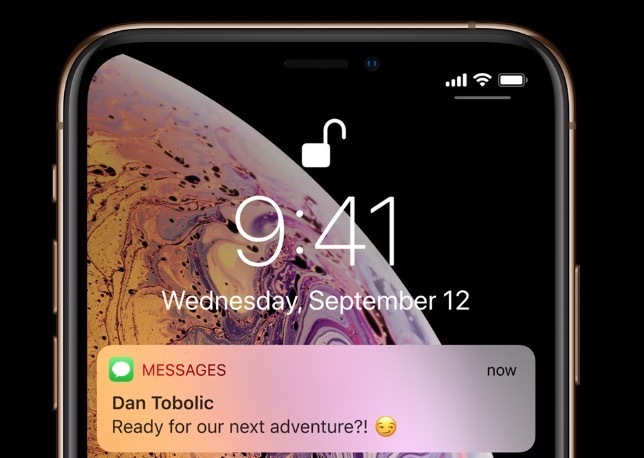 When Apple first introduced the notch last year with the iPhone X, it was mocked by reviewers and the company’s rivals. But other device makers decided that this design was actually practical for housing a front-facing camera while accommodating edge-to-edge displays. So it does not come as a surprise that the notch was added to the iPhone XS along with the iPhone XS Max and iPhone XR this year. Compared to its predecessor, the iPhone XS has nearly the same features including a similar stainless steel band, glass back, edge-to-edge OLED display, wireless charging, and click buttons. However, the wireless charging feature is faster with this year’s model. In terms of color, the iPhone XS and XS Max are available in space gray, silver, and a new gold color. What is noticeable about the colors of the stainless steel bands on the new iPhones are that they are shiny and the sheen is very reflective as you look at it from different angles. This is different from the matte aluminum band used on the iPhone 8 and iPhone 8 Plus. If I were to recommend getting a certain color of the iPhone XS, then I would say that you should get the gold one. The reflective properties of the gold version seem too good to pass up. Every year, Apple and its rivals seem to be alternating when it comes to pushing the boundaries of advanced camera technology. Specifically, the Apple iPhone, Samsung Galaxy, and Google Pixel line of devices seem to one-up each other every time a new flagship is introduced when it comes to having the best camera. And now these companies are using advanced artificial intelligence to drastically improve the photos as you take them. Although the reviews have been mixed about which company has a better camera, a number of them are saying that the iPhone XS line has the best one on the market now. The iPhone XS has the same camera as the iPhone XS Max, which comes as a surprise because Apple usually makes the camera on the larger-sized versions superior to the other models. The dual rear cameras on the iPhone XS are 12-megapixels, of which one is a wide-angle lens with a f/1.8 aperture and one is a 2x telephoto lens with a f/2.4 aperture. And the iPhone XS cameras also have optical image stabilization. Plus the iPhone XS camera takes 4K video at up to 60 fps and slow-motion 1080p videos at up to 240 fps. This ensures that the videos that you take look sharp and high-quality especially when you replay it on larger TV screens. Another improvement that Apple made to the iPhone XS camera involves the image sensors, which absorbs light better than its predecessor. As a comparison, the iPhone XS has larger “micron pixels” than the iPhone X at 1.4 microns this year versus 1.2 microns last year. Since the image sensors in the iPhone XS can collect more light, the low-light photos will look better and the dynamic range is wider. And the iPhone XS camera lens is wider than the iPhone X so more content can be fit into the frame. The autofocus feature on the iPhone XS is two times faster compared to its predecessor. And tapping to focus and the tap-and-hold to lock the autofocus feature is a speedy process. The iPhone XS camera’s Smart HDR features taps into Apple’s A12 Bionic imaging signal processor (ISP) and the device’s Neural Engine. Using artificial intelligence, the Smart HDR feature combines multiple photos that are underexposed and overexposed and combines it into a single photo in order to show the best highlights and shadows. What about the Portrait mode? Apple first introduced portrait mode on the iPhone 7 Plus and it was improved with the iPhone 8 Plus and iPhone X. And it is better than ever before with the iPhone XS and iPhone XS Max. With the iPhone XS, you can also adjust the bokeh effect of the Portrait mode by tapping on the “Edit” button at the top-right and sliding the meter at the bottom for adjusting the depth. Apple’s new Neural Engine is able to separate depth information that is captured from the rear cameras and the front TrueDepth camera. And when you take selfies with the front-facing 7-megapixel camera with the iPhone XS, you are likely going to get a ton of likes on your social media profiles because of how good it will look. For video recording on the iPhone XS, the quad-LED True Tone flash is better at detecting light flickering than before. And the four microphones built into the device are better at capturing stereo sound. The iPhone XS has a 5.8-inch OLED display, which is the same as its predecessor. By using OLED again, the iPhone XS display has deeper blacks, impressive brightness, better power efficiency, and a vibrant dynamic range. And the iPhone XS has the same 2,436 x 1,125 resolution as the iPhone X at 458 pixels-per-inch (ppi). This is the same ppi as the iPhone X and the iPhone XS Max. At this ppi, the colors really pop on the display. The dimensions of the iPhone XS are 5.65 x 2.79 x 0.30 inches compared to the 6.20 x 3.05 x 0.30 inches size of the iPhone XS Max. This makes it easier to carry the iPhone XS around in your front pants pocket, jacket pockets, and hand wallets. The iPhone XS, iPhone XS Max, and iPhone XR have Apple’s second generation of Face ID. Face ID uses the iPhone’s processor to recognize the face of the user in order to unlock the device and allow purchases. Apple pointed out that Face ID is faster and better. Several reviewers have confirmed that this is true, but the iPhone X is pretty fast as it is so it is not as detectable in real-world situations. I would still consider a faster Face ID a pro anyway. Inside of the iPhone XS and XS Max is Apple’s new A12 Bionic 64-bit system-on-a-chip with six cores, of which two are performance cores that are capable of 15% faster-processing power compared to the A11 Bionic chip. And four of the cores are high-efficiency — which use less than 50% power than the A11 Bionic chip. Plus the A12 Bionic chip is up to 50% faster for apps that are graphics intensive. While Apple substantially improved the hardware in its new flagships, it also simultaneously increased the efficiency of iOS this year with the introduction of iOS 12. iOS 12 also has an emphasis on performance improvements for older devices so you should definitely upgrade even if you don’t plan to buy a new iPhone this year. With these speedy components, I have not really noticed any lag time while gaming on the iPhone XS. And opening non-gaming apps take milliseconds. Plus editing and exporting 4K video takes seconds rather than minutes as well. Creating Animoji and Memoji on the iPhone XS is also slightly faster than the iPhone X. So as you move your head around or stick your tongue out, the Animoji and Memoji are very responsive. This is also the case for other augmented reality apps. One of the most underrated features of the iPhone XS and iPhone XS Max is support for gigabit LTE. Gigabit LTE is an advanced version of LTE used by cellular companies to connect to mobile devices. This enables download speeds at 1 gigabit per second, which is the same speed that Google Fiber provides for landline broadband connections. But to increase the cellular data connectivity, the antenna lines were moved around. Now there are two new antenna lines at the top right of the stainless steel band the other is at the lower left. One of the most controversial changes that Apple made when it introduced the iPhone 7 is the removal of the 3.5mm headphone jack. But Apple replaced the space that was previously used for the 3.5mm headphone jack with another speaker thus providing a stereo sound experience. And that has carried over to the iPhone XS and XS Max. The iPhone XS and XS Max have wider stereo playback than before. With this level of sound quality, you may feel like you do not need to take a portable speaker with you to the beach or the pool. Instead you can play your favorite tunes from your iPhone XS itself and still have a solid listening experience. The dual-SIM support is especially popular if you travel extensively and use a single device for personal and work. This feature allows you to manage two numbers and two data plans on a single phone from separate carriers. The iPhone XS Max has two nano-SIM card slots. But the smaller-sized iPhone XS has room for one nano-SIM card so you will need to have an eSIM if you want to use a secondary SIM with that device. This year, Apple bumped up the IP rating from IP67 to IP68. So now the iPhone XS and XS Max are dust resistant and have a water resistance up to 6 feet of water for up to 30 minutes rather than 3 feet of water (IP67). While this is a subtle improvement, it makes all the difference for those of you who enjoy swimming with your device. To appease consumers who were upset about the removal of the 3.5 mm headphone jack in the iPhone 7, Apple provided a Lightning to 3.5mm headphone jack adapter. And it was also provided with the iPhone 7 Plus, iPhone 8 Plus, and iPhone X. But it is not included with this year’s models. The iPhone XS has a 2,658 mAh battery, which is smaller than the iPhone X’s 2,716 mAh battery. And Apple said that the iPhone XS lasts up to 30 minutes longer than the iPhone X. The iPhone XS battery life is not as good as the iPhone XS Max though. For example, the talk time of the iPhone XS is up to 20 hours compared to the iPhone XS Max’s 25 hours based on wireless talk time. And the iPhone XS Max’s lasts up to 13 hours based on Internet use compared to the iPhone XS’ 12 hours. What this means is that you still have to recharge your iPhone XS every day. So I would consider the battery life as average. Note: the iPhone XS and XS Max are fast-charge capable at up to a 50% charge in 30 minutes. Unfortunately, the iPhone XS has a USB-A-to-Lightning cable in the box rather than a fast-charging USB-C-to-Lightning cable so you will have to buy that accessory separately for fast charging. One of the biggest drawbacks with the iPhone XS is the starting retail price of $999. And the 512GB variant of the iPhone XS hits a price of $1,349. So this phone is definitely not for consumers on a budget.